As anyone running around in Marvel’s comic book universes will tell you, though, death tends to be one of life’s less permanent states of being, especially if you’re an X-Men. 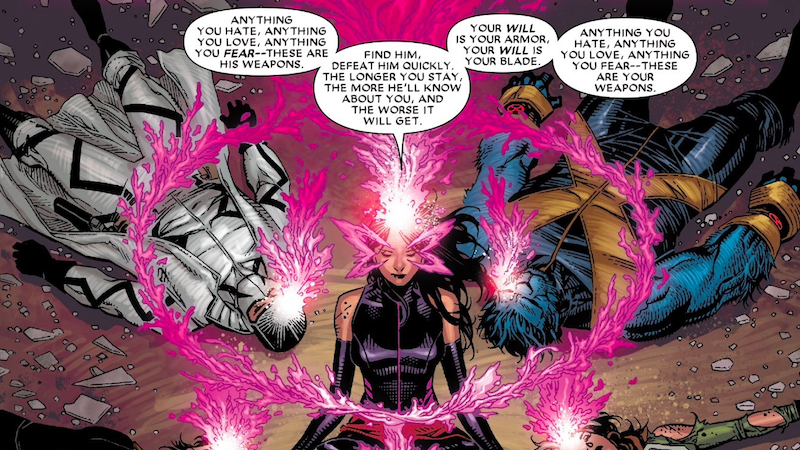 There’s an almost absolute guarantee that anyone who dies on the page is likely to come back eventually—an idea that writer Charles Soule and artist Jim Cheung make all-too-clear in this week’s premiere issue of Astonishing X-Men. This newest adventure for the X-Men opens with a series of mysterious psychic attacks against various psychic mutants that the team is initially unable to explain. As Psylocke, Bishop, Rogue, Gambit, and Fantomex begin to investigate the source of the attacks, they discover that the Shadow King is back in rare form and doing what psychic parasites are wont to do—routinely siphoning off the energies of his victims in an attempt to bolster his own powers. The Shadow King’s actions aren’t exactly new or noteworthy in and of themselves (this is sort of his thing,) but the team is shocked when they journey into the astral plane to take the Shadow King head on and discover that he’s been holding the spirit of a a very, very important psychic hostage. The kind of psychic whose vast powers would have afforded them the ability to resist the Shadow King’s assault for years. The kind of psychic whose very existence would spur the X-Men into action like no other. A psychic who happens to be bald. You know. That psychic. Charles Xavier. So here’s the deal with Xavier: he’s supposed to be very, very dead and in a sense, he kinda still is. Xavier met his untimely end at the end of Avengers vs. X-Men when Cyclops, drunk with power borrowed from the Phoenix force, killed Xavier in a fit of Phoenix Force-induced fury. In fact, if we want to hammer home Xavier’s dead-ness even more, is brain was literally scooped out and brought under the possession of the Red Skull, who harvested it and implanted it into his own brain to get Charles’ vast psychic powers. So, even for comic books, the good professor has been as dead as dead can be. It just seems that now we know that his spirit has lived on in the Astral plane, and is now imprisoned by one of his oldest and most powerful psychic foes. As far as comics deaths go, Xavier’s has been notable for the life-altering impacts that it’s had on Marvel’s characters. It fundamentally fragmented the X-Men, changed the way that the world looked at mutants, and put Young Scott (recently transported from the past to the present) in the uncomfortable position of being labeled as a terrorist for things that he didn’t do. Even the issues since Xavier’s physical death when the Skull stole his brain to get his powers, the crazy story was a potent reminder of just everyone just how significant a presence Charles really was while alive. In many ways, the X-Men became a ship without a rudder in the time after Xavier’s death, an unfortunate coincidence considering that mutants have been faced with all sorts of universe-altering events (see: Secret Empire and Inhumans vs. X-Men) since then. Even if, for now, this appearance is simply Charles’ soul that’s making a comeback, rather than an actual resurrection—he could simply stay in the astral plane, a highly likely outcome considering his body as he knew it doesn’t really exist any more—it’s almost certain that Astonishing X-Men is signaling that Xavier’s due for a major comeback in Marvel’s books at some point soon. But again, this is comics, and comic book deaths as major as Charles Xavier’s tend to have all the permanence of, well... the least permanent thing you can imagine. Honestly though? He’s a sight for sore eyes, and the X-Men could do with another ally on hand at the moment. Because even after Secret Empire is over, the X-Men are going to have confront yet another familiar, fiery friend from their past and they’re probably going to need all the psychic assistance that they can muster.